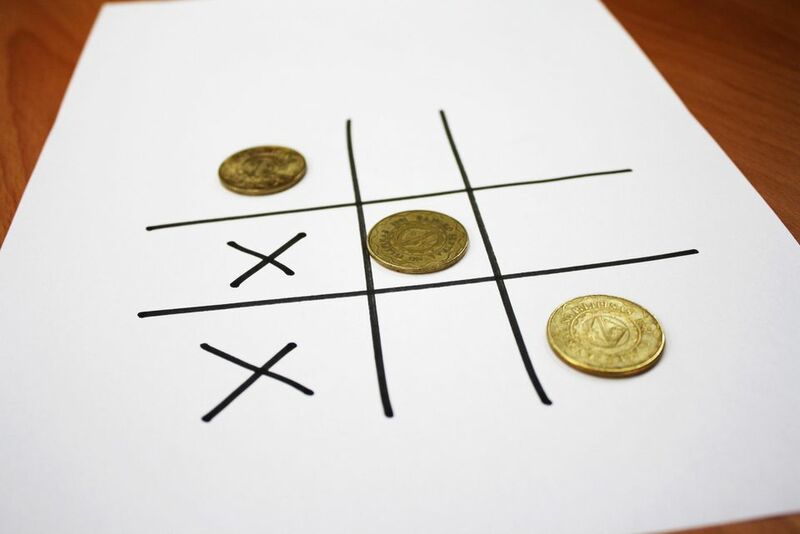 Tic-tac-toe is a simple, two-player game which, if played optimally by both players, will always result in a tie. The game is also called noughts and crosses or Xs and Os. Tic-tac-toe is a game that is traditionally played by being drawn on paper, and it can be played on a computer or on a variety of media. Other games, such as Connect 4, are based on this classic. An early variation of the game was played in the Roman Empire, around the 1st century B.C. It was called terni lapilli, which means "three pebbles at a time." The game's grid markings have been found chalked all over Roman ruins. The first print reference to "noughts and crosses," the British name for the game, appeared in 1864. The first print reference to a game called "tick-tack-toe" occurred in 1884 but referred to a children's game played on a slate. A relatively simple game usually played on a grid of 3 x 3 squares, tic-tac-toe is mainly enjoyed by children. Tic-tac-toe can be made significantly more complex by increasing the size of the board to 4 x 4, 5 x 5, or even up to a 20 x 20 grid. The goal of tic-tac-toe is to be the first player to get three in a row on a 3 x 3 grid, or four in a row in a 4 x 4 grid. To start, one player draws a board, creating a grid of squares, usually 3 x 3 or 4 x 4. The player who is playing "X" always goes first. Players alternate placing Xs and Os on the board until either one player has three in a row, horizontally, vertically, or diagonally; or all nine squares are filled. Gameplay is the same if you are playing on a 4 x 4 grid. The "X" player goes first. And, players alternate placing Xs and Os on the board until a row is completed horizontally, vertically, or diagonally, or all 16 squares are filled. If all 16 squares are filled and neither player has four in a row, the game is a draw. Tic-tac-toe can be also be played on a 5 x 5 grid with each player trying to get five in a row. The game can also be played on larger grids, such as 10 x 10 or even 20 x 20. For any grid of 6 x 6 or greater, it might be best to make your goal to get five in a row. This turns the basic game of tic-tac-toe into a much more complex game with similarities to Pente, meaning "five" in Greek. A goal of Pente is for a player to score five marks in a row.